Doe Lake is a long, narrow lake accessible from Mud Lake via a 20 m lift up and over the beaver dam which created the impoundment. Shallow and weedy for the most part, Doe Lake does include a few fast-breaking, rocky sections. At either end, weedbeds and shoreline timber offer perfect habitat and cover for the lake’s numerous largemouth bass. At the upper end of the lake is an ideal spot for shore lunch / camping. To fish Doe Lake, the boat must be pulled up and over the beaver dam – no easy chore with the larger aluminum boats provided at Smoky Lake Lodge. A better way is to tow one of the canoes from the main camp and use it for fishing Doe Lake. It is well worth the effort. 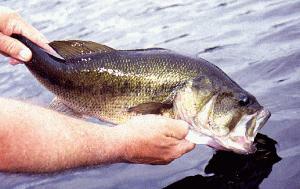 Doe Lake has only largemouth bass, but they are both numerous and good average size. Tossing spinnerbaits along weedlines, near fallen logs and parallel to shorelines is one way to fish the lake quickly and efficiently. However, a plastic worm fished along the shoreline will always produce twice as many Doe Lake bass ! And, for topwater enthusiasts, this place is eutopian.